If you hesitate to smile due to one or more missing teeth, we understand the toll that can take on your confidence. Dr Zina Mahdi (Dentist) has extensive experience providing dental implant surgery, allowing patients to successfully restore missing teeth at Northern Dental Design. 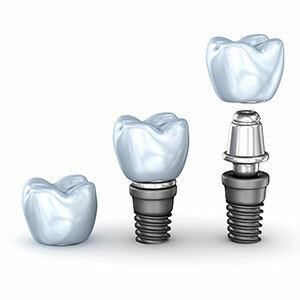 A dental implant is also considered an artificial tooth root that is screwed into the jawbone. Composed of highly durable and long-lasting titanium, an implant serves as an anchor to hold a replacement tooth (the crown) or a bridge securely in place. First, we will take a detailed 3D radiological and clinical assessment of your implant needs. Based on this assessment, a 3D digital mock-up of the proposed completed treatment outcome is then designed and presented to you and Dr Zina to attain a clear picture of the final implant solution. Once you agree to proceed with treatment, a precise implant placement plan will be created. Next, we will export the plan to an implant guide manufacturer for the creation of a precision surgical “keyhole” guide which is used at the time of implant placement. Depending on how complex your case is, the dental implant placement procedure takes between 60-90 minutes. Dr Zina uses keyhole surgery which results in minimal post-operative discomfort and side effects. You may even be able to return to work the same day. In some instances, the implant(s) can be provisionally restored at the same time as they are placed or later on the same day (All-on-4 implant procedure). Following the recommended period of implant healing (3-4 months), the final permanent implant prosthesis (crown or bridge) is digitally designed, fabricated and inserted. With dental implants, you can get the beautiful, functional smile that you’ve always wanted. Take that first step towards achieving the smile of your dreams by scheduling a consultation with Dr Zina.